Palacito is a smart and stylish “little palace” ideally located for your Santa Fe getaway. Take a 3 minute walk to the Teahouse on Canyon Road or an easy stroll along the tree-lined East Palace Avenue through the historic Eastside neighborhood to the Santa Fe Plaza. The air-conditioned 1250 square foot home combines contemporary conveniences and Santa Fe charm. Comfortably sleeps up to 4 people. The upper floor is an open design with a high ceiling providing light-filled gathering spaces in both the living room and the kitchen/dining area. The living area, filled with local art, has comfortable furnishings for relaxation, and the gas-fired fireplace adds coziness on cooler evenings. The very well-appointed kitchen with a gas-range provides a spacious layout for those who like to share meal preparation. Enjoy your meals in the intimate dining area or take them outside to experience the beautiful New Mexico light. From the kitchen there is easy access to a shaded outdoor deck where you can unwind and barbeque. A second private patio area off the living room invites you to sit and share a conversation. The upper floor also has a half bathroom and a full-size washer and dryer. The lower floor has two comfortably-sized master suites, each with their own private bathroom. All bathroom fixtures are contemporary. Both bedrooms have walk-in closets. The first bedroom has a comfortable queen bed. The attached bathroom offers a tub/shower combination with two sinks. The second bedroom has a king size bed that can be made into two twins on special request. This bathroom has a generous-sized tile shower and one sink. Accommodates up to 4 people. Great accommodation for two couples, a family, a girlfriend’s getaway, or a mother-daughter adventure. This vacation rental has the convenience of two off-street parking spaces. We do not permit pets. •	Accommodates up to 4 people. We really enjoyed our stay here! This home is lovely with every comfort. It is newly remodeled and immaculately clean. We felt very much at home. The location is in a classic Santa Fe, quiet neighborhood within easy walking distance to many wonderful locations, including Canyon Road art galleries. We appreciated the attention to detail and beautiful decor. We highly recommend staying here. It's a great place from which to experience Santa Fe! We’ve been to Santa Fe and stayed in other VRBO places but never before in this neighborhood. East Palace Avenue is one of the best residential walks in town. Walking to the plaza down Palace took us by some interesting homes, and there are more trees along the street than in other parts of town. Going the other direction, The Teahouse on Canyon Road is just a few minutes down the block; although we’d been there before for lunch on a previous trip, we found that they have a soothing and simple dinner menu. We walked to The Compound one evening for a splurge. It’s really good food. The house itself was quite comfortable for lounging after a day hoofing around town. We also entertained some local friends for brunch. I found the kitchen better appointed than most with plenty of room to whip up a quick frittata while grilling a batch of asparagus outside. Six of us had plenty of room to eat and visit. Everyone liked the colorful artwork. Parking is easy right next to the house. My husband took me to Santa Fe for my birthday. We have been to Santa Fe many times, and he knew I would want to stay somewhere that had Santa Fe charm and color, was walkable to downtown and Canyon Road, and was peaceful. Boy, did he get it right with this place! We walked to dinner and galleries on Canyon Road and had many nice walks to the Plaza. 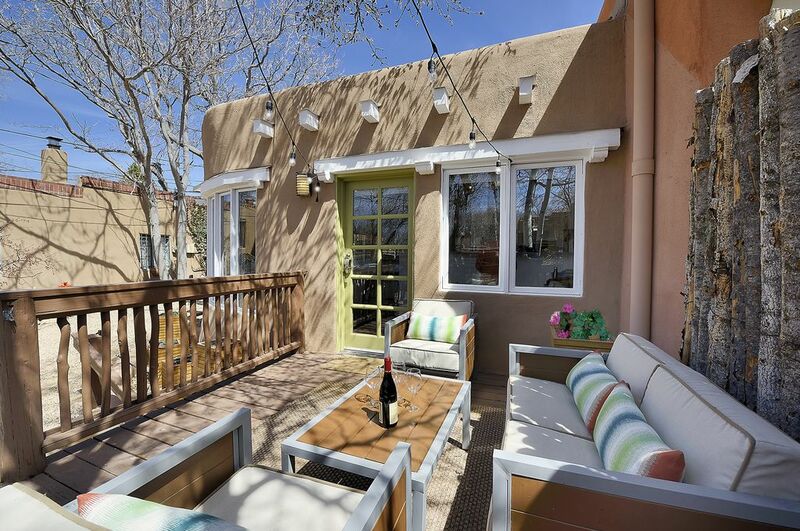 This is a wonderful place in an ideal Santa Fe location. Very well appointed and a fabulous kitchen. Property managers very helpful. A great way to spend a birthday!